In 1953 Elvis Presley walked into Sun Studios to pay for a few minutes of studio time and in 1956 Bill Haley topped the charts with the first rock ‘n roll number one – Rock Around the Clock. In 1962 Louis Armstrong became the oldest recording artist to hit number one with Hello Dolly and in 1999 Cher became the oldest female artist to reach number one with the hit song – Believe. Kung Fu Fighting became the first disco number one hit in 1974 We also have the foreign language number one section with songs like Rock Me Amadeus and La Bamba. Some of the songs that made it to number one in South Africa, The UK, Australia and USA were Heaven Is a Place on Earth, Eye of the Tiger and Another Brick in the Wall, while recording artists such as Elvis Presley and The Beatles both had the most number one hit songs in music history. 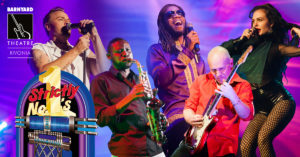 The show pays tributes to 80s icons such as Meat Loaf, Billy Ocean, Stevie Wonder and George Michael – to the iconic rock bands such as U2, Dire Straits, Pink Floyd and Van Halen to pop sensations like Beyoncé, Ed Sheeran and Taylor Swift. Strictly No. 1’s is a show for all ages, all music tastes and celebrates all styles of fashion and song – crisscrossing 60 years of number one hits. Get ready for a number one countdown that will keep you rocking ‘till the break of dawn.